The market for notarizations may not strike you as a booming industry, but it accounts for billions of transactions annually, according to Polaris Partners’ Pat Kinsel. Kinsel, a venture partner at the Boston-based firm, says there are an estimated 1 billion to 2.5 billion documents notarized each year, making it a $30 billion market. Even if you only consider the 300,000 people each month who search online for a notary service, it could create a $100 million business. That’s part of the impetus for Kinsel’s founding of Notarize, an app-based startup that aims to claim a portion of the market by offering remote, digitally verified, video-based notarization services. Notarize, which is headquartered in Virginia partly because of a law passed in the state in 2011 (see below), announced its launch today with a $2.4 million seed funding round from Polaris and Detroit-based Ludlow Ventures. Notarization takes many forms, Kinsel said: for example, a power of attorney or a medical authorization form for a loved one; a consent form from a parent if a minor wants to get a tattoo; or mortgage closing documents. “With any high liability contract, institutions both public and private want to make sure that the person who is said to have signed it actually did,” he said. Yet even as the uses remain numerous, the process of getting a notarization hasn’t been updated, Kinsel said. That’s tough for notaries, the folks officially approved to notarize documents, who must at times travel far distances and to potentially sketchy locations to verify something, he says. The new company aims to change all that. Users who need a document validated can download the Notarize app, which is now only available on iOS, which will connect them with a public notary agent in Virginia. The agent can verify a person’s driver’s license or birth certificate in the app using two companies Notarize has licensing agreements with, IdenTrust and Confirm.io. And the agent will video chat with the user using WebRTC to confirm they are who they say, Kinsel said. The user can print out or send a digital copy of the notarized document. The video transactions are saved for five years, Notarize says. A law passed in Virginia in 2011 and enacted in 2012 allows notaries in the state to do their job via video call, which makes Notarize possible, Kinsel said. 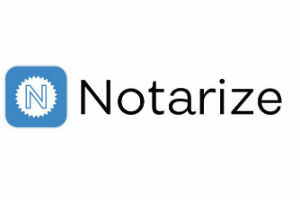 Notarize has verified that documents certified through the app will be accepted in all 50 states, and the company includes relevant explanations from a state’s laws on the back of notarized documents, he said. Notarize charges $25 per notarization. Most documents only require one notarization, though a packet could require more, Kinsel says. The fee is definitively higher than a traditional notarization, the price of which is set on a state-by-state basis. 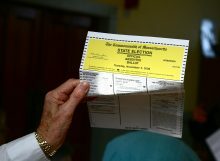 The amount in Virginia is $5 per notarization. Kinsel says the cost of his service is more comparable to the cost of a traveling notary, who come to meet a client. Including the cost of travel, that fee can run from $50 to $150, he said. “We believe we are an order of magnitude more convenient (on demand with no scheduling, waiting, and coordination) and much cheaper,” he wrote in an e-mail. He said the company isn’t allowed to pay notary agents in Virginia more than $5 per transaction, and declined to provide further details about how Notarize’s profits are divided between it and the companies it has licensing agreements with. Companies like UPS have offered notary services, a move that Kinsel said may be more of a move to get people through the door. He said he is not concerned about competition because the app was “nontrivial to build” and required detailed work with legislators in Virginia. Notarize is initially focused on consumers who are seeking out notarization services online, but will eventually begin targeting businesses and governments, Kinsel says. The service will be available 24 hours a day, seven days a week, in part as a way to target people living overseas who have trouble notarizing documents, Kinsel said. Kinsel was the co-founder and CEO of Spindle, a startup acquired by Twitter in 2013, before he joined Polaris. At the venture firm, he has led Series A investments in Boston-based Drizly and San Francisco-based Lob. Adam Pase, an entrepreneur and the former chief strategy officer at Hope Street Group, is Notarize’s chief operating officer and is himself a notary in Virginia, while Kinsel is not. Kinsel says the 24 notaries who have signed up to work (as contractors) for Notarize so far have expressed interest in being available for the late night and early morning hours. If not, at least Pase is there as a backup. “At every startup, everyone has got a different bucket of water they’ve got to carry,” Kinsel said.